Lake Country HDO Foam Pads feature a dual-density design. 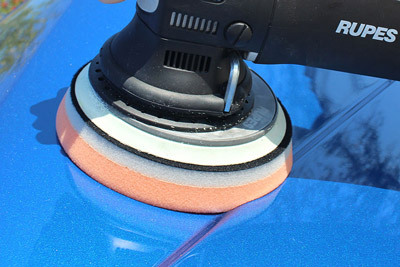 This unique design eliminates the concaving effect that other pads experience, allowing the pads to maintain optimum surface contact and extended usage on long-stroke machines, like the Rupes LHR 21ES “Big Foot” Random Orbital Polisher. Lake Country HDO Foam Pads will outlast and outperform any other foam pads on a long-stroke dual action polisher – guaranteed. Lake Country 6.5 Inch HDO Foam Pads were designed for the Rupes LHR 21ES Big Foot Random Orbital Polisher, the Griot's Garage BOSS G21 Long-Throw Orbital Polisher, or other similar long throw polishers. The Lake Country 6.5 inch HDO Foam Pads have a 6.5 inch foam face with a 6 inch backing. A 6 inch backing plate is recommended for best results.